Drew & Rogers can be your single source for all of your digital and offset printing needs. We offer fast turnarounds at competitive prices, a wide variety of color, size and finish selections, and can accommodate any order size. We utilize the best printing processes for all of the products we produce, which allows us to provide our customers with the best quality and price. Ask about warehousing, kitting, assembly and print-on-demand solutions too! For over 70 years we have been here for our customers, helping them find cost effective and timely printing solutions. Digital printing refers to methods of printing from a digital-based image directly to a variety of media. It usually refers to professional printing where small-run jobs from desktop publishing and other digital sources are printed using large-format and/or high-volume laser or inkjet printers. 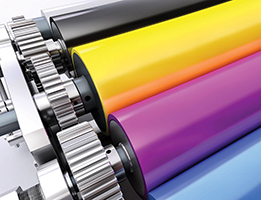 Digital printing has a higher cost per page than more traditional offset printing methods, however it allows for on-demand printing, short turnaround time, and full customization. Fine art – archival digital printing method which includes real photo paper exposure prints and giclée prints on watercolor paper using pigment based inks. 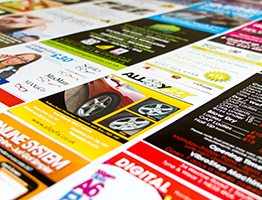 Print on Demand – digital printing used for personalized printing. Example: Children’s books customized with a child’s name, photo books (such as wedding photo books), etc. Advertising – used for outdoor banner advertising and event signage, trade shows, in the retail sector at point of sale or point of purchase, in personalized direct mail campaigns and more. Offset printing uses three cylinders to transfer an image onto a substrate. The first cylinder is mounted with the printing plate. The image on the printing plate is ‘right’ reading or written with the right side up. The first cylinder is inked and the image transferred or offset onto the second cylinder, which is mounted with a rubber blanket. The image on the second cylinder is reversed or becomes ‘wrong’ reading. Finally the image is transferred from the blanket cylinder onto the third cylinder or the substrate. The substrate is mounted on the third cylinder also known as the impression cylinder. The image is once again is reversed and becomes ‘right’ reading or right side up in the final printed version. Offset printing touches every aspect of our lives, from influencing education through the printing of books, periodicals and other reading material, to the packaging industry by creative printing of packages for consumer goods.